CALCUTTA CUP matches are so often dour, attritional battles but this Twickenham clash was a world away from that, featuring six tries and some helter-skelter running rugby. Scotland had their moments, bringing their supporters to their feet as early as the tenth minute when debutant wing Sean Maitland dived over for a try, to give them a 5-3 lead, but England weathered the storm and took control of the breakdown, possession and, ultimately, the match. England’s half-time lead was only 19-11, but they stretched away in the second half, putting Scotland under pressure for long periods. Scotland did all they could in defence, but the gaps eventually opened up as England recycled possession and went through the phases and the final score is a fair reflection of the game. Centre Billy Twelvetrees emulated Maitland to celebrate his first cap with a try and an accomplished performance. Stuart Hogg was the outstanding performer for Scotland, illustrating once again that if Scotland can only win more ball, they have the talent to use it to good effect. 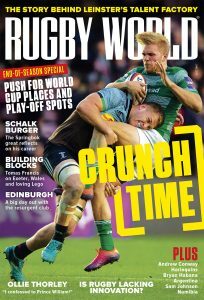 A 30th minute try from that arch finisher Chris Ashton gave England a 16-8 lead and from that point on they never looked like losing the match. The home side had taken an early 3-0 lead with an Owen Farrell , Scotland had come flying back at them and led briefly, but England didn’t panic, got back the scoreboard ticking over with two more penalties and then Ashton struck. Owen Farrell was the official Man of the Match and deservedly so, as he set England’s back line in motion and mixed his game up intelligently. His place-kicking is almost faultless – he mised just one in this match – and he scares the living daylights out of opposition defences with his footwork and deft handling. Watching him run a game as big as this, it’s easy to forget he is only 21 years old! Owen Farrell: Ireland’s Johnny Sexton won’t be receiving that red No 10 jersey in the post just yet. Farrell had a terrific all-round game, floating out a sublime pass for Geoff Parling’s try and kicking almost everything that was put in front of him. Stuart Hogg: The Scotland full-back put in a really bright performance, asking questions of the England defence with his bold runs from deep. Johnnie Beattie: The No 8 ticked plenty of boxes on his return to Scotland’s side after 18 months in the wilderness. He was everywhere in the loose, carrying the ball nine times. Joe Launchbury: Another really accomplished performance from the England lock, and he was almost rewarded with a try, having one disallowed and coming close to the line on another occasion. Tim Visser: No tries this time for the scoring machine and he was overshadowed by Maitland and Ashton in that area. He chased his own kicks well, but was found wanting in defence once or twice. 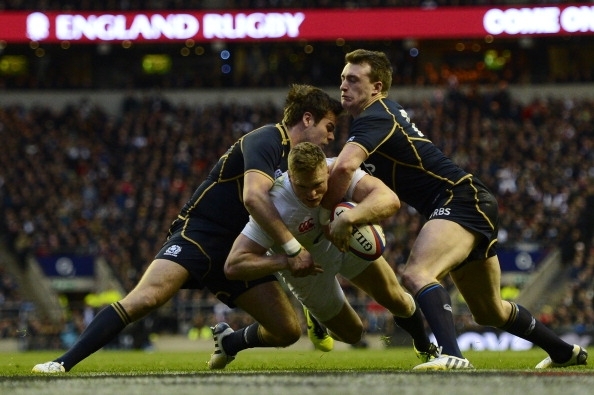 England made 597 metres in attack compared to Scotland’s 225 and the Scots were forced to make 128 tackles. England won 106 rucks and mauls while Scotland managed just 55.